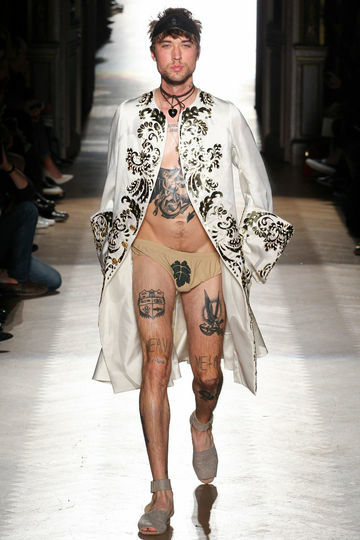 The Vivienne Westwood Fashion Shows are never "just" about fashion. 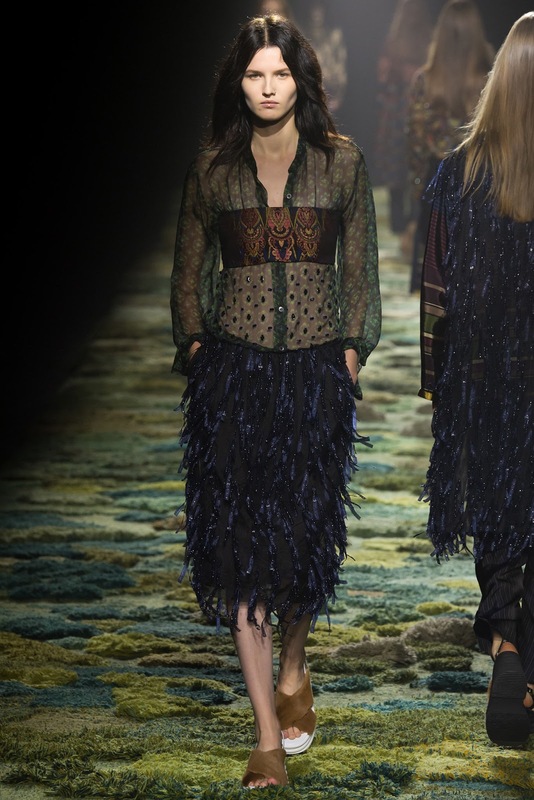 She transports messages with her collections, and thats exactly what she did with the S/S 2015 Fashion show. The looks have elements of the garden of eden, which reminds of her photoshoot with her husband where they posed as adam and eve for the project "End Ecocide". With her collection she calls the peoples attention to this exact project, and requests them to take better care for the environment. Of course we can identify with this message very much, as living consciously and taking good care of nature and the environment is very important to us too, and we love how she uses her show to arouse people's interest for this subject. She uses the pieces to represent different social classes, with prints of art pieces and museums, silk and lace that represent the wealth of our society, and on the other hand more rural elements, like baskets worn as hats. The demonstrative make-up is sometimes very strong, in other looks exaggerated and surreal, and sometimes blurred. There are oversized and draped blouses and dresses, some plain, others more colourful. 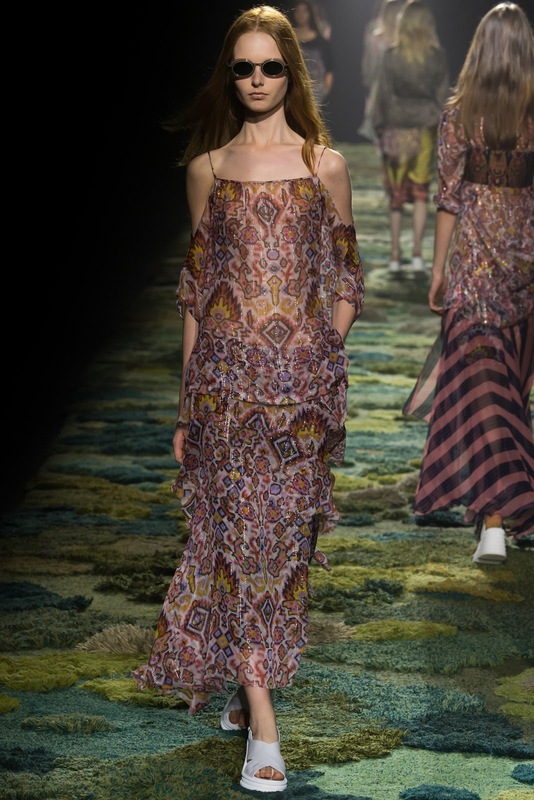 In some looks complex patterns and prints are combined, and even though it looks unruly and wild the pieces still harmonise in a beautiful and calm way. The fashion show can take you away into Vivienne Westwoods world and if you let her, you can feel her message in every piece of the collection. 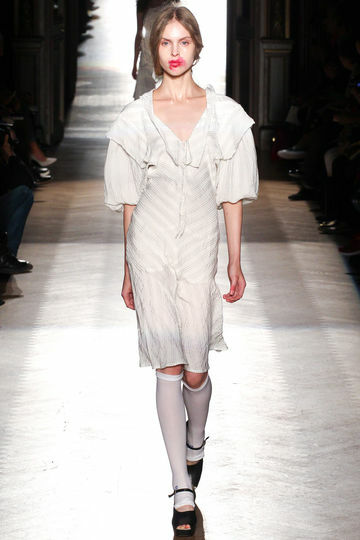 For more Vivienne Westwood Fashion visit the official website. 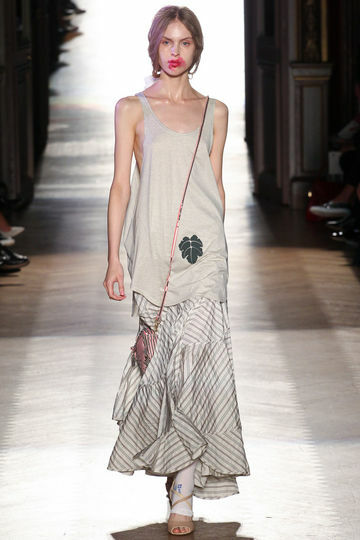 The Isabel Marant S/S 2015 Fashion show had the touch of american countryside chic. In the collection there are clean and straight cuts, and simple colours, such as black and white. 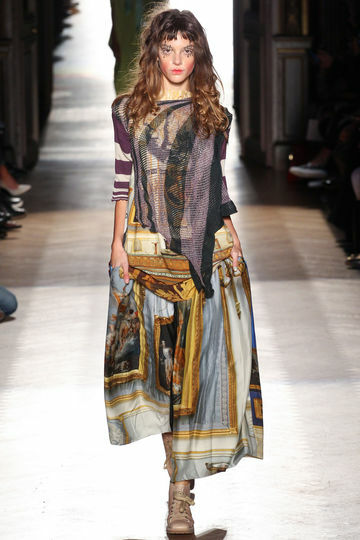 Other pieces are more arty, with graphic patterns that look very wild and rebellious. What we like best in this collection are the oversized fringe jackets and wests, and the bohemian chic that we find in some of the pieces and that transport kind of a "free summer spirit" for us. 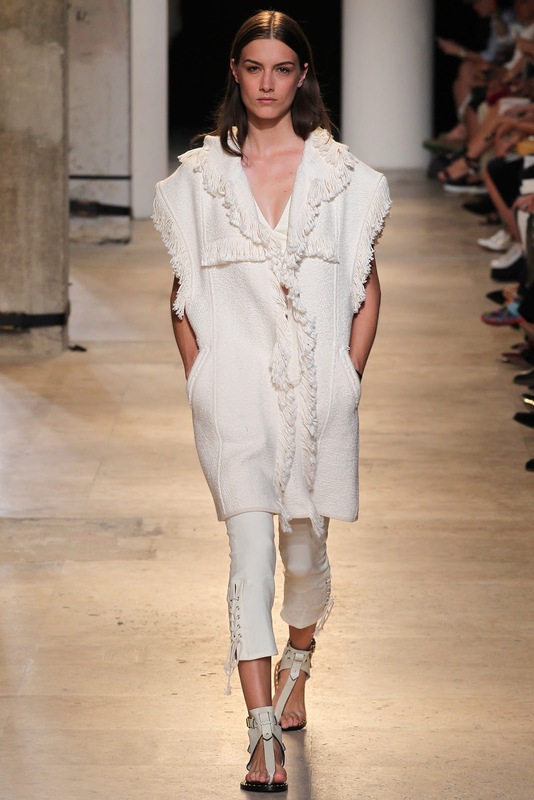 For more Isabel Marant Fashion visit the official website. 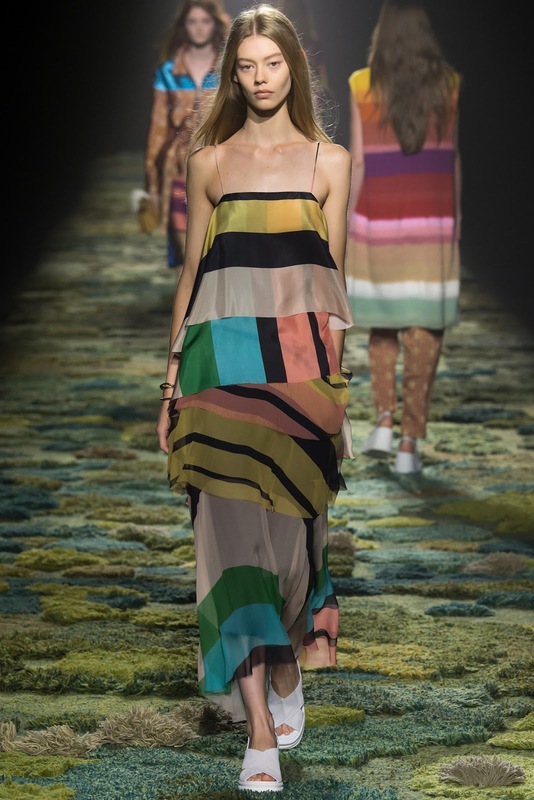 The Dries Van Noten S/S 2015 Fashion Show was very impressing for us. We felt like the fashion show transported us right into a fairytale. The models were floating like fairys on a forest floor, which made the whole atmosphere even more special. 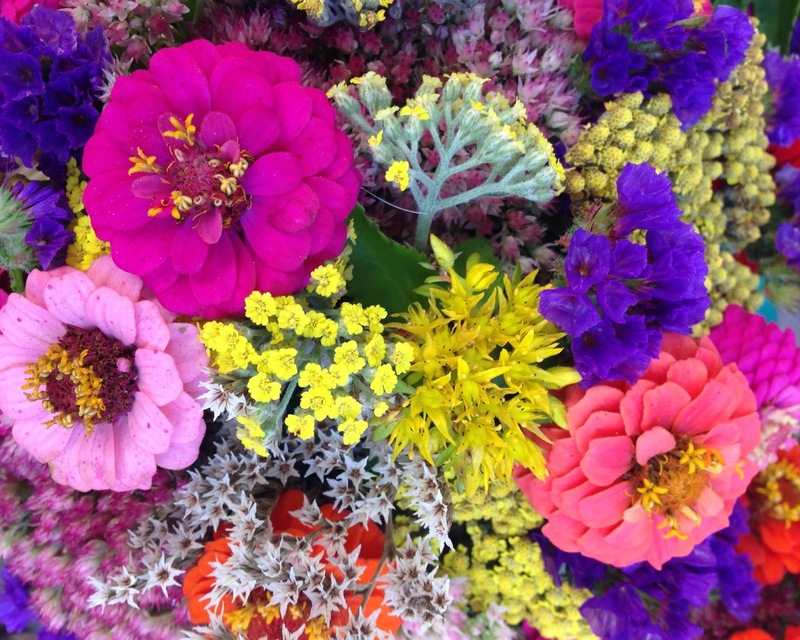 As a contrast to the natural set, there were many different colours, but all of them in shades as if illuminated by sunlight on a summer morning. 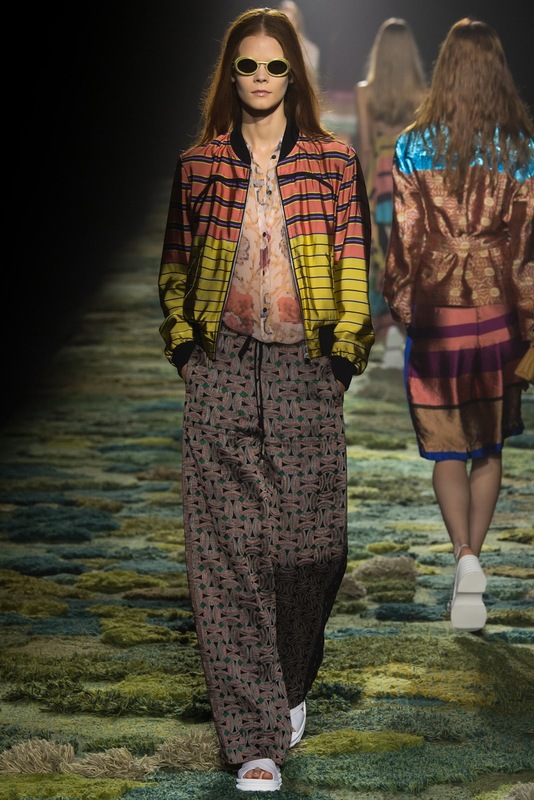 The art inspired collection contained masculine and loose cuts, wild combinations of patterns and colours and the designs are dreamy and playful. The most beautiful moment for us, was the ending of the show. 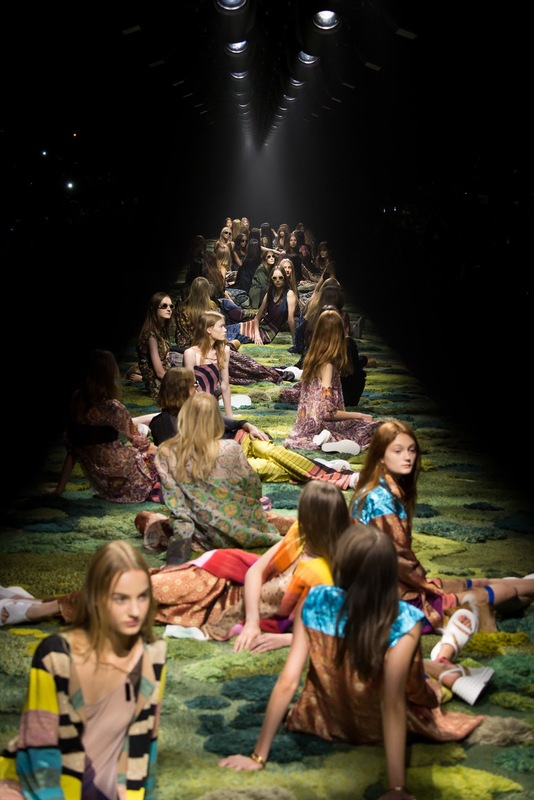 The models did not walk the runway again as usual, one after one, but instead they sat and laid down on the floor. 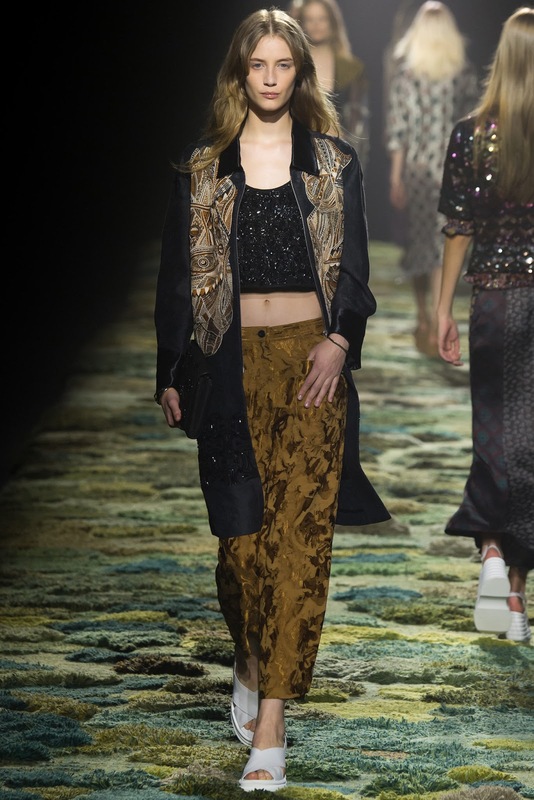 For the complete show and more Dries van Noten Fashion visit the official website. 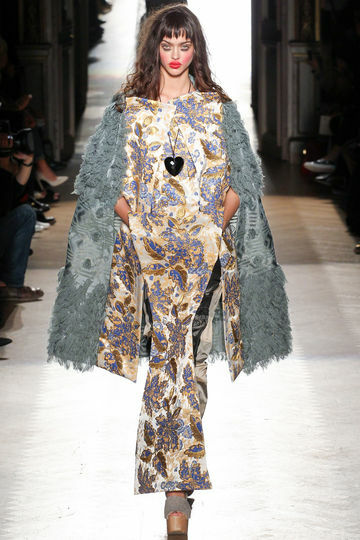 The Topshop Unique Fashion Show at this years London Fashion week was opened by Cara Delevingne, who is also the face of the Topshop FW 14/15 campaign. The collection is very sporty and still glamourous, it is very dynamic and spreads a young spirit we like a lot. With Emma Farrow, Topshop can definitely keep up with the trends set by all the beautiful high fashion shows we have seen so far. The looks vary from very elegant, sheer, embellished dresses to high waisted pants with sporty bandeau tops. For more Topshop Fashion visit the official website. Probably all of us have watched the "the lion king" movies once during their childhood. We all know about Simba's adventures and Scar's intrigues. Finally the original broadway musical will make its way to Basel Switzerland and we can't wait to go see it! From March 2015, the original production will take us straight into the world of the Lion King, with amazing costumes, masks and breathtaking music. From the catching african rhythms full of energy to the emotional film music by Sir Elton John and Sir Tim Rice, that will touch the audience deeply, we can be prepared to be absolutely amazed. 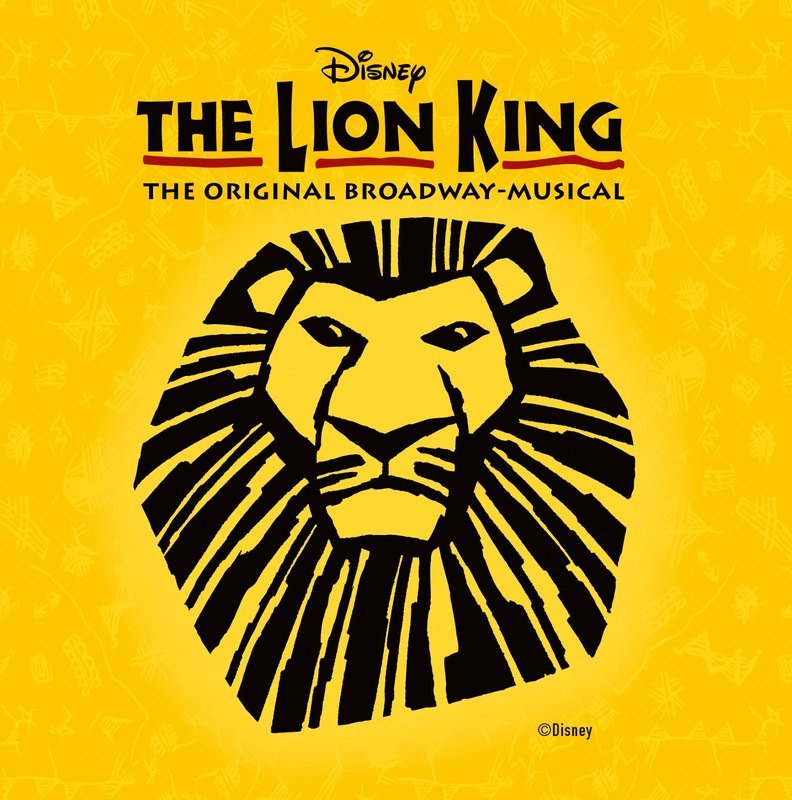 The musical THE LION KING has a success story that is beyond comparison, and the combination of actors, masks and puppets takes theater to a completely new level. The director of the THE LION KING musical, Julie Taymor, was the first woman ever to win a Tony Award for directing a musical, and THE LION KING has won more than 70 other grand prices. For a first impression, watch the official Video of the musical, there are no more words needed. Tickets are available here and for more information visit the official website of The Lion King. 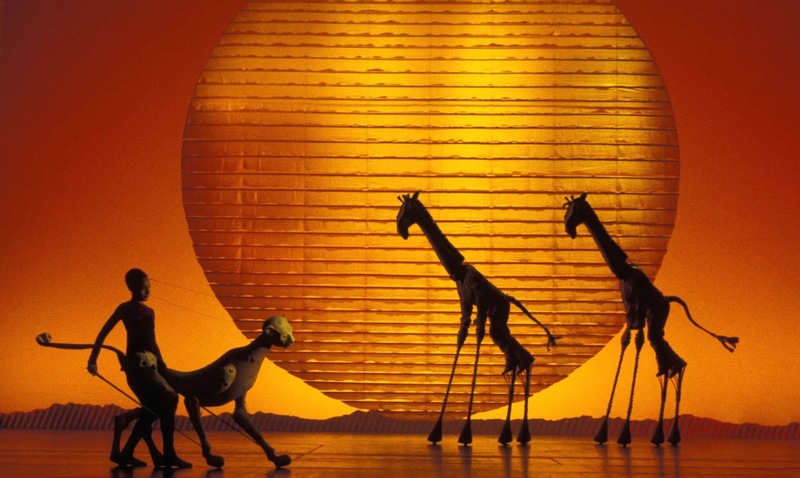 We will keep you updated with any news concerning THE LION KING - the original broadway musical in Basel. 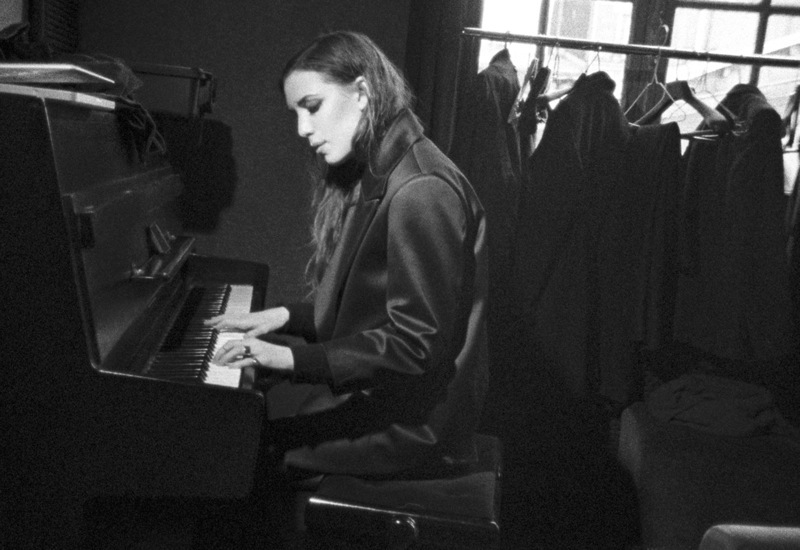 The waiting has come to an end: The Lykke Li for &other stories collection (we have talked about it in a previous post) will be available online and in the stores from September 4, 2014. 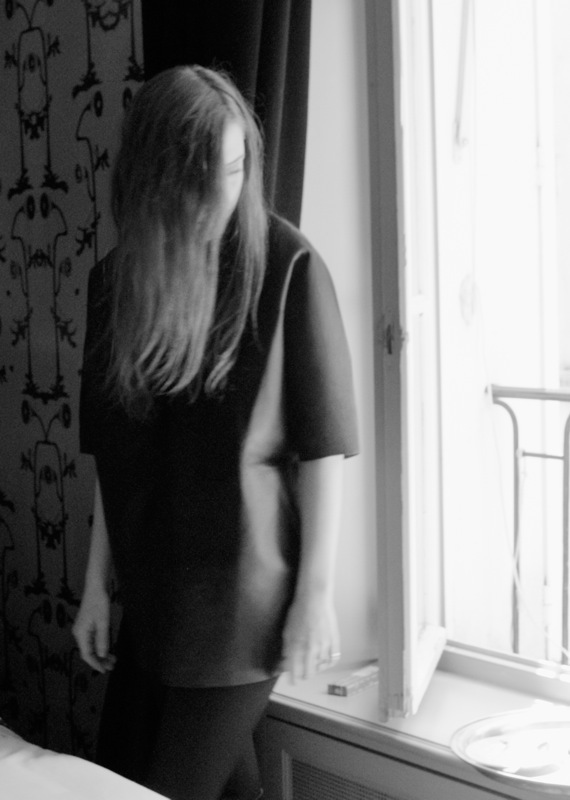 The collection is mainly in her favourite colour, black, and has a very mysterious and masculine touch. "This collection will be my uniform until the day I die. (...) From hotel slippers and loafers, to cigarette pants and the perfect blazer, to the cashmere sweater and the silk shirt. You get the point, be the man you want to marry!" The designs are rather simple but the materials are very luxurious. From finest cashmere sweaters to precious leather loafers everything is represented in this collection. For the full collection and to shop your favourite pieces, visit the official website. Prepare yourself! By the end of this month, you can get Karl Lagerfeld as a Barbie doll all for yourself! Together with Karl Lagerfeld, mattel has created a limited edition Barbie doll exactly in the style of the iconic designer. The doll wears a tailored black jacket and black jeans, a white, high-collared men's shirt and of course also black sunglasses and fingerless gloves. She wears her white hair in the signature ponytail and looks just like a female miniature version of Karl Lagerfeld. The Barbie Lagerfeld will be launched Monday, September 29, 2014. If you want to call one of these precious little dolls your own you have to be fast, there are only 999 pieces available, in selected Karl Lagerfeld stores, at Colette in Paris and online at Net-a-Porter.